FunBites are a great kitchen tool for families with little ones. It's perfect for for picky eaters and works great for lunches. FunBites cuts kids' food into fun-shaped bite-sized pieces. FunBites are with the strongest plastic material available and is very sturdy and durable, not to mention dishwasher safe. We were given the opportunity to review both Cube It and Luv It FunBites. The Cube It creates twelve bite size square pieces and the Luv It creates a big heart that gets cut up to twelve geometric shapes. My kids absolutely loved these. I first tried them in their lunches without telling them, I wanted to surprise them to see if they would notice, they certainly did. Both kids came home asking to have their sandwiches cut up like that from now on and I've been doing so ever since we got them. 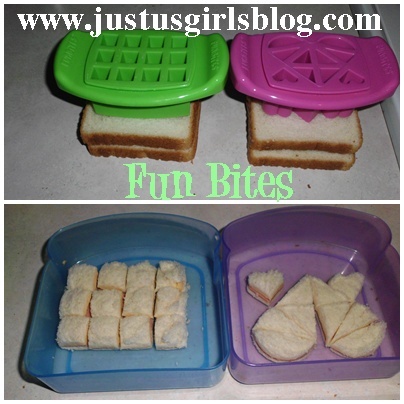 Unlike the average sandwich cutter, FunBites comes with two pieces, one piece that's the curved blade to cut the sandwich into pieces and the other piece is the popper topper, which helps pop the food out within seconds. You don't get that with your normal sandwich cutters, this was the best part to me. I loved how easy it was to use and how it not only worked for sandwiches, but also worked for pancakes and waffles too, which is something we needed so that the kids breakfast was easy to cut up. There are so many different foods you can use to try FunBites. Another great thing about these food cutters is that kids can use them too, which is perfect for any kid. Kids love feeling independent. I'd highly recommend FunBites for parents with kids, they'll love them. To save money on shipping, FunBites are available at the Canadian shop Tiny Wiggles as well! Kids Demonstrating How To Use FunBites! Want to make sure you can buy FunBites at your local Walmart? Vote for them now on the "Get On The Shelf," Contest so we can buy them in store! Disclosure: All opinions are my own. I received both FunBites at no cost for the purpose of this review. No other compensation was received. A big thank you to FunBites for providing the giveaway. Luv it for my daughter! The cube it! My boys would LOVE it. I'd like the Luv It! I would pick the Luv it. I would love the cube it.Be awesome tool to create appetizer bites. Creates a big heart from 10 geometric shapes! I like the cube it. I like the Cube it one. I like the luv it. i love the cube it one. Cube it.Love to try it.Me and my little neices will have fun together making bite size lunch's and snacks.A good way to keep fun in the family. I would choose the Cube It. I think my guys would love the Cube it - such a fun product!! I like the Luv It! I'd like the cube it! Personally, I like the Luv It, but since I have all boys, I'd probably have to go with the Cube It. The Luv it:) My son would LOVE IT!!!! I would love the LUV IT! Thank you! These look so amazing!! :D Super cute! My boys love having their sandwiches cute into fun shapes.